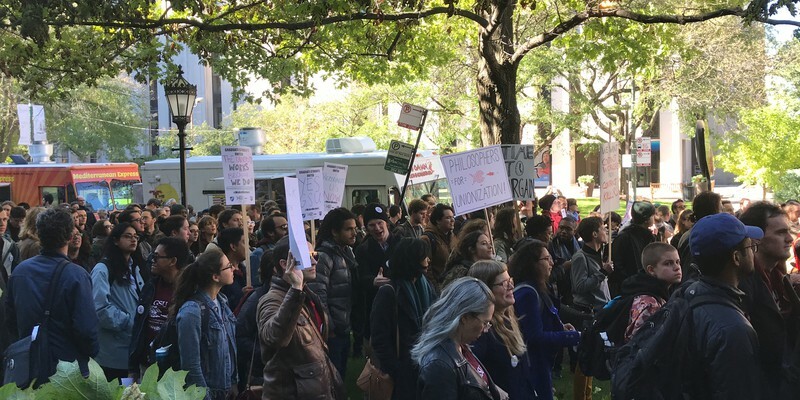 By Kaeli Subberwal / Oct. 19, 2018, 1:43 p.m.
November 18th, 2018 marked one year since the University of Chicago’s graduate students voted to form a union. To commemorate the occasion, and to continue pressuring the University to sign a contract with the union, graduate students and sympathizers walked out of classes at 11:03 a.m., in honor of the 1,103 votes the unionization effort received. Once the crowd had assembled, speakers took turns urging the university to sit down at the bargaining table with the Graduate Student Union (GSU). Illinois Federation of Teachers president Daniel Montgomery has been involved with GSU’s efforts in the past, and said that he had never seen a crowd so big at a GSU protest. Sam Joyce, a third-year undergraduate and president of Students Organizing United with Labor (SOUL), asserted that the protesters were not walking out on their students, as Dean John Boyer claimed, but rather were demonstrating their commitment to undergraduates’ education. “Without grad workers and their labor, I wouldn’t have received the education I received at this university,” he said. Ben Laurence, a philosophy lecturer at the university who has studied and taught workplace justice and is a member of UChicago Faculty Forward, a union for non-tenure-track faculty, urged the strikers not to give up hope. “It is possible to win, even here,” he said. He added that the university should immediately sit down with GSU and begin good-faith negotiations for a contract. 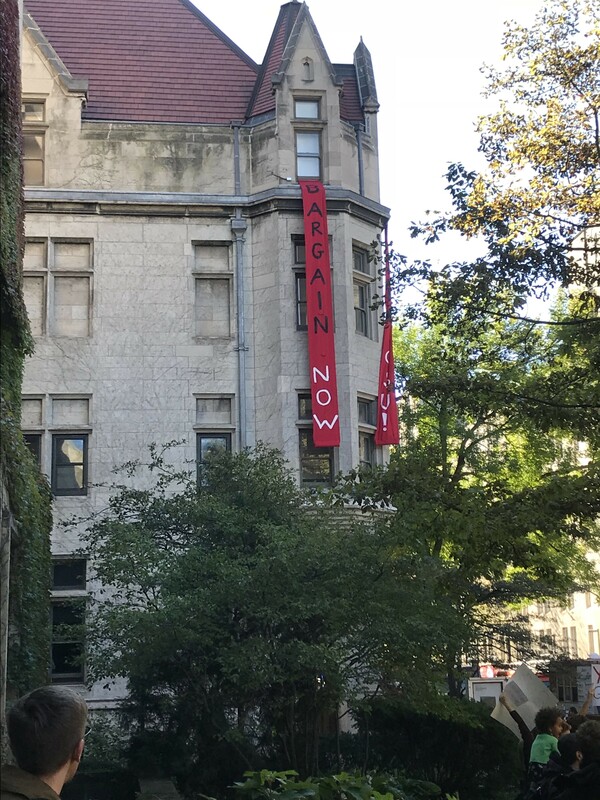 Once the rally was fully underway, two banners were unfurled from the top-floor windows of nearby Cobb Hall, reading “Bargain Now.” They were greeted with uproarious cheers from the crowd. As at other GSU protests, legal observers from the National Lawyers Guild were present, as were a handful of law enforcement officers. Although GSU has not yet reached a deal with the university, and argues that Zimmer has been hiding behind President Trump’s allegedly anti-union National Labor Relations Board, the turnout and fervor of the protesters at the walkout made it clear that the fight for a contract is far from over. Montgomery bolstered the crowd at the end of his speech by urging them to continue fighting. Photo is courtesy of the author.